The 1290 Super Duke R got us thinking. What if we could match The Beast’s interstellar performance to all day, two-up comfort? What if we would train the most dynamic naked bike ever to race any paved road the world has on offer? Regardless of the weather. Over and over again. So we brought out the big guns, aiming for state-of-the-art ergonomics, electronics and extreme stamina. The result is a long distance V-twin rocket that proudly roars past the top of the food chain, hungry for more. For miles. The faster, the better. A motorcycle that is equally happy hunting horizons, as it is chasing superbikes. And crushing them – not only at cruising speeds. Welcome to the world of the 1290 Super Duke GT, where refinement, speed and ultimate performance rule. BODYWORK & GRAPHICS: Designed to devour unlimited kilometers, for optimum wind and weather protection and KTM state-of-the-art finishing, the 1290 SUPER DUKE GT is one of its kind. INTEGRATED PANNIER MOUNTING: Panniers offered as KTM PowerParts can be easily fitted to the integrated mounting system of the motorcycle, while keeping the sporty look and unique style of the motorcycle. Remove the panniers in an instant, and instantly be badass. DASHBOARD: The KTM 1290 SUER DUKE GT supplies its rider with all necessary and desirable information on a state-of-the-art, clearly arranged instrument cluster from automotive manufacturer VDO. Core data is displayed on a central gauge that consists of an analogue rev counter with integrated, adjustable gearshift light and an LCD display. This display is dominated by a digital speedometer and supplemented with a digital clock, a gear indicator, bar graphs for coolant temperature and fuel level plus the display for the selected riding mode. A second LCD display is positioned to the left of the central instrument, which serves the purpose of conveying important additional information and displaying numerous menu pages as a screen for the on-board computer. Everything is tidy, clean, clear, intuitive and simple to operate – even on the go. LED CORNERING LIGHTS WITH INTEGRATED LED INDICATORS: The 1290 SUPER DUKE GT has the segment's first LED cornering lights integrated into its fuel tank. On the left and right side of the fuel tank, the cornering lights consist of three LED segments, using the lean angle sensor of the MSC system. Depending on the lean angle, the KTM cornering light can use up to all three segments, always giving the rider the perfect view to where he is going. Integrated in the cornering lights are the LED indicators, for a unique and exclusive look. Well deserved in a bike like this. BRAKES: More than adequate deceleration is ensured at the front wheel by the two radially mounted Brembo M50 four-piston Monoblock calipers, actuated by a radial brake pump, each gripping onto floating 320 mm discs. The spacing between hand brake lever and handlebar is adjustable so that the lever is within easy reach for every rider. The front brake receives effective support from the disc brake on the rear wheel, which features a 240 mm diameter disc and a two-piston Brembo caliper. The enormous potential of the Brembo brakes can be exploited to the full thanks to its sportily tuned anti-lock braking system. The ABS even has a supermoto mode, for when you absolutely feel like backing it in while on holiday. CHASSIS: The laser-cut, chrome-molybdenum steel trellis frame, welded to the highest standards, contributes to excellent chassis geometry. It's extremely stable and weighs only 9.8 kg, which helps keep the overall weight down: 212 kg (ready to ride, without fuel) and 228 kg fully fueled and ready to race the sun. SINGLE-SIDED SWINGARM: The jaw-droppingly beautiful, light alloy, single-sided swingarm on the KTM 1290 SUPER DUKE GT is not only the lightest in its class, but also meticulously manufactured and generously dimensioned – a reassuring partner when the Super Duke GT unleashes its full potential. The rear wheel is fitted to an axle that is 50 mm in diameter and bolted in place with a 60 mm central wheel nut. A high-precision, eccentric adjuster is used for tensioning the chain. 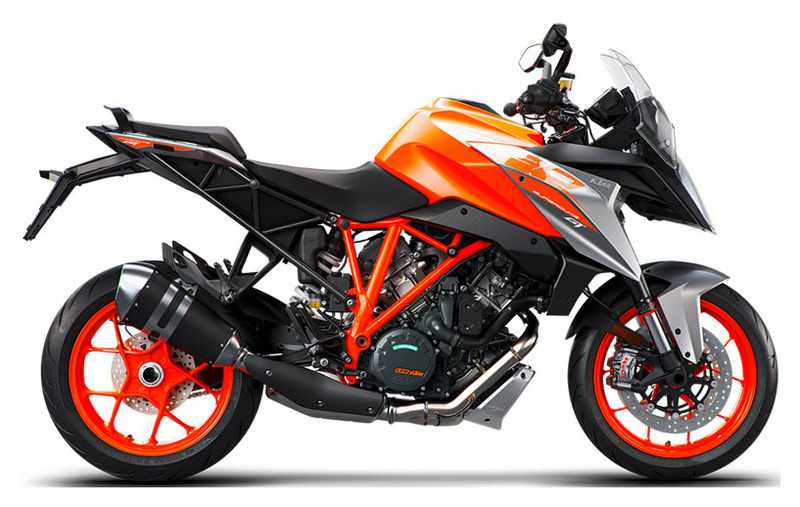 ENGINE & EXHAUST: Based on the 1301 cc engine of the 1290 SUPER DUKE R, aka “The Beast”, the 1290 SUPER DUKE GT is clearly the Alpha within its segment. ENGINE: The 1290 SUPER DUKE GT packs a powerful punch for fully loaded tours, has massive torque from the bottom up and lacks the need for extensive gear shifts. It’s equally happy cruising around town as it is giving superbikes a run for their money when the chips are down. The engineers took the cylinders from the 1290 SUPER DUKE R and adapted them to a specially developed cylinder head and crankshaft to give the 1290 SUPER DUKE GT a powerplant that perfectly fits its sovereign appearance. Or would you interpret 173 hp and 144 Nm of torque, of which 114 Nm is already available at 3,250 rpm, as anything less than royal? CYLINDER HEAD: An absolutely key element in the outstanding performance and smooth response of the 1301 cc 75° V-twin are the unit’s cutting-edge four-valve cylinder heads. These combine twin-plug ignition, flow-optimised ports and a slick, low-friction valve train with cams from each cylinder’s twin-overhead camshafts driving DLC-coated cam followers. MAPPING: The EFI mapping, in combination with the plain bearing and timing, transfer the power with low vibration and reduced engine noise. This substantially increases the smoothness of the 1290 SUPER DUKE GT power train, so you don’t have to fear for your fillings ever again. CRANKSHAFT: The responsiveness and free-revving nature of the KTM 1290 SUPER DUKE GT's engine are also enhanced by the very low reciprocating weight of its crankshaft. Moreover, the flow-optimized shape of the crank webs boosts the particularly low-loss running of the crank drive. TWIN IGNITION: The twin-plug ignition system controls the two differently sized spark plugs in each cylinder head independently of each other in such a way that more efficient combustion and a smoother, optimally controlled combustion sequence are achieved at all times. The result: even more and even better controlled power, lower fuel consumption and lower emissions. And so the world is a better place. RIDE-BY-WIRE: Instead of the electronic injection system's throttle valves being controlled by cables, ride-by-wire processes throttle twist grip movements with the help of electronic sensors and activates the throttle valves accordingly using servo motors. However, the ride-by-wire system on the KTM 1290 SUPER DUKE GT goes the extra mile: it electronically translates the throttle commands of the rider into optimum throttle valve positions for the current riding situation. Choking, jolting and involuntary wheelies are a thing of the past. Voluntary ones, however, could easily be a thing of your future. PISTONS: The forged piston structure on the KTM 1290 SUPER DUKE GT, borrowed from Formula 1 technology, results in a high loading capacity, despite the extremely short and lightweight design. Although they have grown in diameter by three millimeters compared with those of the 1190 RC8 R, the pistons on the SUPER DUKE GT are a whole 47 grams lighter. In this way, reciprocating weight is minimized, thereby maximizing the responsiveness and frivolous nature of the engine. Furthermore, the piston skirts have a state-of-the-art, hard-anodized finish. Not only does this reduce friction, it is also particularly hard-wearing with consequently a positive impact on durability. SERVICE INTERVALS: A unique mix of the highest quality components combined with a fully developed and reliable engine allows extremely long service intervals of 15,000 km. That’s a lot of adventures. ERGONOMICS & COMFORT: Improved ergonomics such as low foot pegs and a large fuel tank are there to make the rider and passenger feel comfortable. And that’s no easy feat. Think about the things to consider: stack and reach, leg arch length, seat height, seat foam, knee angle and knee contact, handlebar width, position and offset, tall riders, short riders, heavy ones and featherweights… But we made it, by tailoring the bike to your needs. HANDLEBAR: You can adjust the handlebar over 22 mm and four positions. FOOTPEGS: Choose three positions for the brake and shift lever. WINDSHIELD: The windshield gives the rider maximum protection from the elements. It can easily be adjusted with only one hand, just by pushing it and adjusting it to fit your needs. Different mountings of the windshield bracket allow an even wider spread of possible positions. FUEL TANK: The 23 liter, long range fuel tank, in combination with the low fuel consumption of the 1290 engine, easily provides hundreds of kilometers of exciting riding without caring about a fuel station; an important benefit for touring in desolate regions. The fuel tank also protects the rider´s lower body from wind and weather, so you can chill without feeling chilly. SOFTWARE & ELECTRONICS: Keep the 1290 SUPER DUKE GT under full control while exploiting its full potential - That's what the unique electronics package of this motorcycle allows. Lean-angle sensitive electronics intervene to provide maximum adhesion, and optimum acceleration for hunting horizons and chasing superbikes. Combined ABS provides the control for stopping the action instantaneously when needed. MSC (MOTORCYCLE STABILITY CONTROL) WITH C-ABS: The ultimate in safe deceleration. One component of the comprehensive Bosch MSC assistance package is the world's first lean-angle sensitive cornering ABS. Based on the high-quality 9ME modulator, it unites the talents of combined braking and lightning-quick, efficient pressure modulation with the high quality Brembo hardware to make the most advanced braking system on the market - no-one brakes more progressively or safely, even at extreme lean angles. Plus: the brakes are combined. When the front brake lever is actuated, the rear brake is always applied purposefully in order to optimise ride stability when braking. If required, not only can it be switched off, but also placed in supermoto mode. LED CORNERING LIGHTS WITH INTEGRATED LED INDICATORS: The 1290 SUPER DUKE GT has the segment´s first LED cornering lights integrated into its fuel tank. On the left and right side of the fuel tank, the cornering lights consist of three LED segments, using the lean angle sensor of the MSC system. Depending on the lean angle, the KTM cornering light can use up to all three segments, always giving the rider the perfect view to where he is going. Integrated in the cornering lights are the LED indicators, for a unique and exclusive look. Well deserved in a bike like this. SUPERMOTO MODE: The fun-loving supermoto mode allows the rider to block the rear wheel as and when required - a prerequisite for committed supermoto riding and deliberately executed slides. The ABS function remains active on the front wheel, even in this mode. HEATED GRIPS: The 1290 SUPER DUKE GT comes fitted with heated grips. Cosy. QUICKSHIFTER: The GT is equipped with a race-derived quickshifter. It allows upshifts to be made under any load without using the clutch, which gains precious time that would otherwise be wasted in closing the throttle. And that would be a pitty. SUSPENSION COMPONENTS: The innovative WP semi-active suspension system introduces a new level of comfort and safety in motorcycle riding. The rider can select three spectrums of use: ‘Comfort’, ‘Street’ and ‘Sport’, while the SCU (Suspension Control Unit) adapts the damping rates in real-time to the riding surface and rider, based on the information provided by a set of stroke sensors and accelerometers. It also reads the vehicle load, making the suspension suited to different weights. STEERING DAMPER: With so much propulsive power, the front wheel could become very light, which could quickly lead to unpleasant kick-back on uneven roads or following a slight stimulus at the handlebar. The SUPER DUKE GT prevents this safely with a reliable and sensitive WP steering damper. WHEELS: The Pirelli Angel GT’s on the KTM 1290 SUPER DUKE GT offer eager steering, with a broad grip range and fantastic stability. These tubeless sports tires are fitted on alloy rims manufactured in a low-pressure die casting process. Not only do these featherweight wheels make the bike lighter overall, they also minimize the unsprung masses and moment of inertia, with a positive impact on the handling and ride dynamics.